While most hot sauce companies stick to simple pepper sauces with varying degrees of heat, Big Fat's (Niles, IL) dares to be different with a creative line of sauces, each with it's own unique flavor profile. 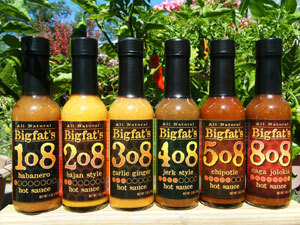 Big Fat's sauces vary in every way possible: flavor, color and heat level. Whether you want a spicy habanero sauce or a traditional Caribbean jerk sauce, Big Fat's has what you're looking for. Jeremy Walsh, president of Big Fat's, was kind enough to send bottles of two of their sauces: 208 Bajan Style and 408 Jerk Style. Jeremy felt that these two sauces were best suited for grilling and BBQ. I recently put both sauces to the test on a grilled pork loin. 208 Bajan Style: This sauce is unlike any mustard sauce that I've ever had. It combines blazing hot habanero peppers with tangy mustard and vinegar. Additionally, the sauce features a decent amount of finely ground carrot giving it a unique texture. According to the bottle, the origin of this sauces flavor comes from Barbados. The sauce can be used as a condiment for dogs, burgers, chicken or pork. I brushed some on a grilled pork loin. I also used a bit of sauce to dip the meat in. The habanero heat is obvious, but not overwhelming. The heat level doesn't distract from the flavor at all. The sauce added significant zip to my pork loin, but I'm not sure that was the best application for the sauce. My recommendation would be to use the sauce on burgers in place of mustard. 408 Jerk Style: I was particularly excited about using Big Fat's Jerk Style sauce. I love Caribbean flavors and was interested to see Big Fat's take on the traditional jerk sauce. The sauce is thin and loaded with spice. Though it has some brown sugar, it's not a sweet sauce like the Caribbean Jerk wing sauces found at your local bar and grill. It's much more of an authentic, traditional jerk sauce. The sauce works well as a marinade for chicken or pork. You can also pour it on the meat as it cooks as I did with the pork loin. The habanero heat is significant in this sauce. It burns, but it's a pleasant burn. It was really an excellent compliment to the grilled pork. I really like what Bigfat's has done. It takes creativity and courage to make sauces outside of the norm. They've already got a great lineup of sauces and have more in development. I also love their commitment to wholesome, natural ingredients. You won't find any artificial preservatives in Big Fat's products. Click here to see Bigfat's website. See how the sauces rate on our "Product Reviews" page. 3 Response to "Big Fat's Hot Sauces"
Thanks for the great reviews. I'm glad you enjoyed the sauces. You should try the 2o8 Bajan Style on some seafood, especially scallops, cod/halibut and crab legs. Add a little butter and it's amazing. Great review. We enjoy Big Fat's hot sauces as well. We met Jeremy at a fiery foods show and he's a great guy who makes excellent sauces. Highly recommended! It is always good to give it a try on these hot sauces.